China’s property stimulus is misdirected. The country’s real estate downturn is minor compared with the US or the UK and a natural bottoming will improve the market’s health. Tax and bureaucracy relief for farmers and small business would have been an economically preferable stimulus. China’s property market has suffered only a modest downturn. The floor area of residential properties sold in January-November declined 18.8%, compared with the previous year, while real estate investment grew 20% in the same period, although it, too, is slowing. By comparison, new US home sales declined 37% in January-October 2008 from the previous year. To keep a healthy property market, China needs to ensure that finance remains available, possibly reduce interest rates generally, and allow the market to establish a lower price level at which transactions clear in areas where overbuilding has occurred. Meanwhile China’s exports in November were down 2.2% from the previous year, the first monthly drop since 1999, while imports fell 18% and foreign investment fell 36% from November 2007. 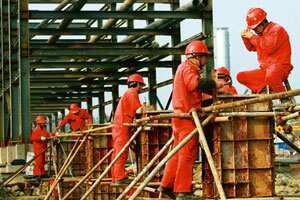 Thus China’s industry, its engine of growth and largest absorber of new employees, is in considerable trouble. To alleviate rural poverty and slow the flow of rural residents to cities, China should eliminate some of the multiple taxes on land and agricultural output, while ensuring that a private system of rural land ownership is fully operational throughout the country. To absorb new urban workers, China should improve tax treatment of smaller enterprises, and simplify its business bureaucracy. While low-end urban real estate development continues to be a priority, tax and financing breaks for second homes should not be. The real estate stimulus measures presented by the Chinese government up to now appear designed to relieve political pressure and placate special interests. They are, however, no solution to improving the country’s economic performance.